RALEIGH (WTVD) -- A "Coming Soon" sign is now posted outside a downtown Raleigh storefront and a small group is feverishly working to open doors. Volunteers are going to unveil a restaurant meant to bring the community together. 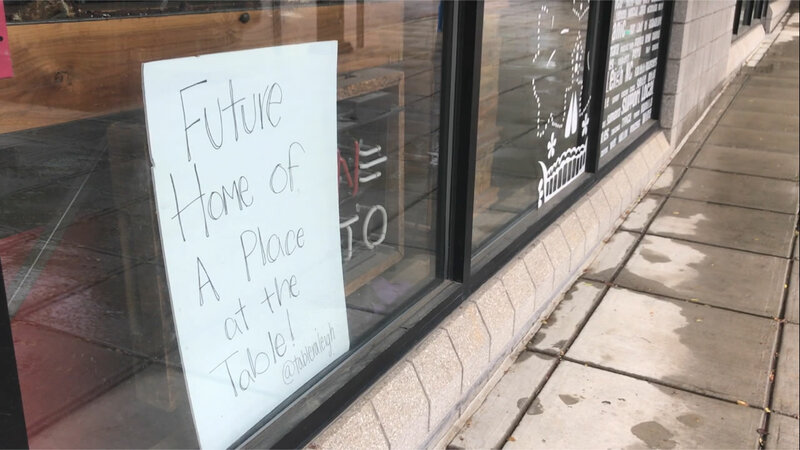 "There's a soup kitchen and food banks, but there is no place where everyone can come together and share a meal," said A Place at the Table Executive Director Maggie Kane. Kane is helping to open a pay-what-you-can eatery. A Place at the Table is going to offer healthy food options to those in need regardless of means. Patrons are encouraged to pay what they can afford, or make a donation to help a family. "Raleigh is a very pay-it-forward kind of city," said Kane. "This is a place for people with means to get involved." The restaurant is the first of its kind in the City of Oaks. There are more than 60 other pay-what-you-can restaurants across the world. The locations are part of the global One World Everybody Eats network. The nonprofit eatery is going inside the recently closed down Cafe de los Muertos on Hargett Street. That's located in the Warehouse District, which is experiencing an economic boom and several apartment buildings are under construction right now. The Board of Directors is pushing to open doors by Thanksgiving. "We do have quite a bit of work to do in the space, but our goal is to open November 28th which is Giving Tuesday," Kane said.